Controversial lawmaker state Rep. Sally Kern is pushing a bill again this legislative session that would allow creationist ideas, such as the so-called intelligent design theory, into the state’s science classrooms. House Bill 1551, which I’ve written about before, has passed the Common Education Committee on a 9 to 7 vote and could be heard by the full House soon. It’s a bad bill that is nothing more than religious intrusion into education, and, if passed, will almost certainly lead to an expensive lawsuit. The bill would require state educational authorities to dumb down its public school students, making them less prepared for college or work training. 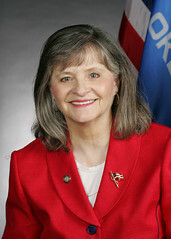 Kern, pictured right, an Oklahoma City Republican, is nationally known for her comments in recent years disparaging gay people, African Americans and women. She’s the wife of a local Baptist minister, and often blends Christian fundamentalism with her office. Note her “Proclamation for Morality.” This bill is just another part of her religious crusade. Kern has generated a tremendous amount of bad publicity for Oklahoma, and HB 1551 is just another example of a flagrant religious gesture that will be mocked and ridiculed inside and outside the state. Let’s take a close look at the bill, which is a piece of disingenuous subterfuge. It’s called the “Scientific Education and Academic Freedom Act,” which is just the opposite of what it represents. A title more representative of what the bill does would be “The Death of Academic Freedom Act” because it would replace critical inquiry with religious precepts. The bill notes that the legislature finds “that the teaching of some scientific concepts including but not limited to premises in the areas of biology, chemistry, meteorology, bioethics and physics can cause controversy.” It mentions these areas, in particular: biological evolution, the chemical origins of life, global warming, and human cloning. The phrase “can cause controversy” is strikingly nebulous. There’s no scientific controversy over these topics, only religious or political controversy, especially with the theory of evolution. In addition, “can cause controversy” could apply to just about anything in a school’s curriculum, including interpretations of history or political systems. How can we possibly define “can cause controversy”? Note the modifying “can.” It “can” but then again it might not. Educational authorities in this state shall also endeavor to assist teachers to find more effective ways to present the science curriculum where it addresses scientific controversies. What controversies? What are the “effective ways” to help teachers with these “can cause” controversies? It’s just another blanket statement that could be interpreted in a myriad number of ways. Students may be evaluated based upon their understanding of course materials, but no student in any public school or institution shall be penalized in any way because the student may subscribe to a particular position on scientific theories. But how exactly would a student be penalized in the first place? The bill’s language and intent is vague because it’s undoubtedly a disingenuous attempt to bring religious ideas, such as intelligent design, into the science classroom. Intelligent design, which has been invalidated as science by a federal court, argues that the natural world is so complicated only a “designer” (i.e., wink, wink, a god) could be responsible for it. Intelligent design is just creationism dressed up in faux scientific jargon. It is NOT a scientific counter to the theory of evolution. I’ve given my reasons against HB 1551 in a previous post. To summarize, there’s no scientific controversy over the topics the bill addresses, teachers will feel forced to present religious concepts in science classroom as “controversies,” students will waste valuable class time on issues better addressed at a church, and the state’s image will suffer. The bill would also make it more difficult for the state to produce and attract physicians and medical researchers. This is in a state with poor national medical rankings and a low college graduation rate. The bill is similar to one passed recently in Louisiana. That bill resulted in a science organization cancelling its convention in New Orleans and a petition signed by 75 Nobel Laureates calling for its repeal. The city of New Orleans has voted in favor of repealing the law, and a state senator has filed a bill to repeal it as well. Do we really need this type of negative publicity and energy in Oklahoma? Here are the organizations that have already lined up to oppose the bill: Oklahoma Academy of Science, Oklahoma Science Teachers Association, Oklahomans for Excellence in Science education, Oklahoma Mainstream Baptists, OKC and Tulsa Interfaith Alliances and most major national science organizations, which includes the largest scientific organization in the world, the American Association for the Advancement of Science. This is a bad bill that will do irreparable harm to Oklahoma. A similar bill, SB 1742, sponsored by state Sen. Josh Brecheen, is now dormant. I wrote about that bill here.